Like that cool old school look of dead animal heads on your study / library wall? Here you can do it without the messy animal killing exercise. This is also known as 'vegan taxidermy'. Rachel Denny: Domestic Trophies series. This is the artist whose work got me interested in the whole fake taxidermy thing. These are made using old jumpers usually sourced from op shops which are then felted and used to cover plastic formers. She has also more recently branched out into other animals. This particular piece is Lion and Lamb. 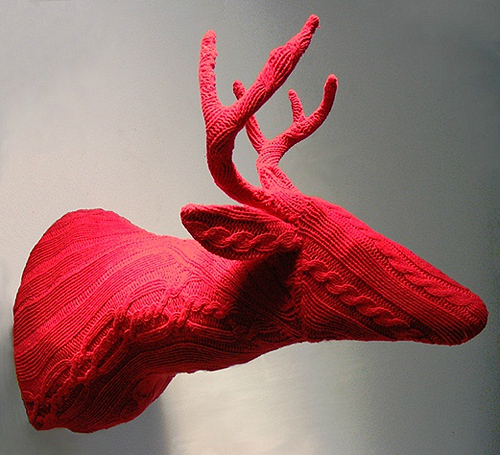 Shauna Richardson does amazing crochet Taxidermy or 'crochetdermy' as she calls it. Her work is incredibly realistic and life size with glass eyes, fake claws and plastic teeth. She even chooses deliberately coarse wool to more closely reflect the real fur of the animals. For a slide show of fantastic pictures of of Shauna's work in urban settings see here. 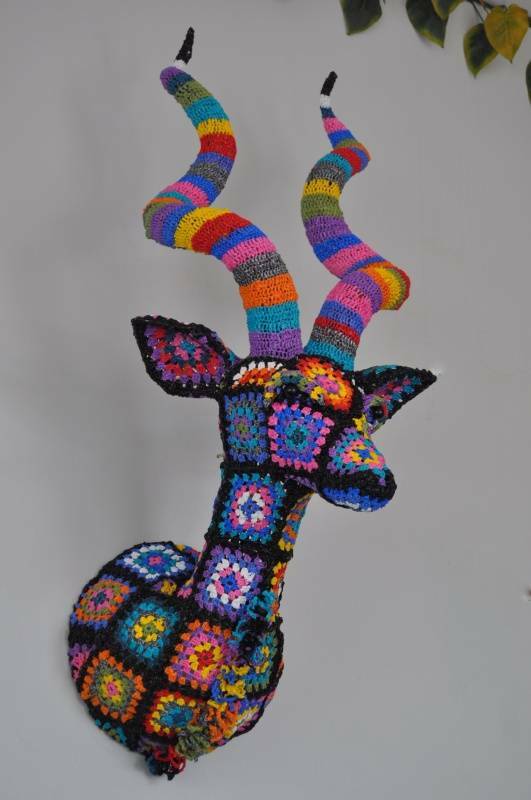 Nathan Vincent also produces crochet taxidermy concentrating on African animals. Perhaps not strictly taxidermy but still awesome artwork nonetheless. 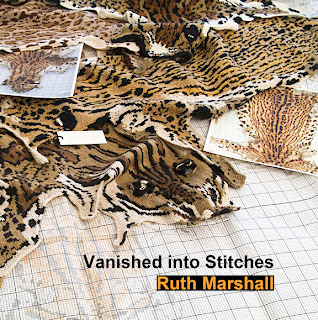 Ruth Marshall creates incredible knitted replicas of big cat skins to preserve a vanishing species. 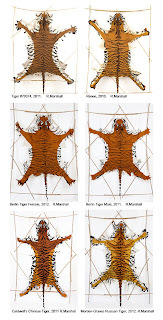 Look at these awesome tiger skins. Don't worry. They're not real. 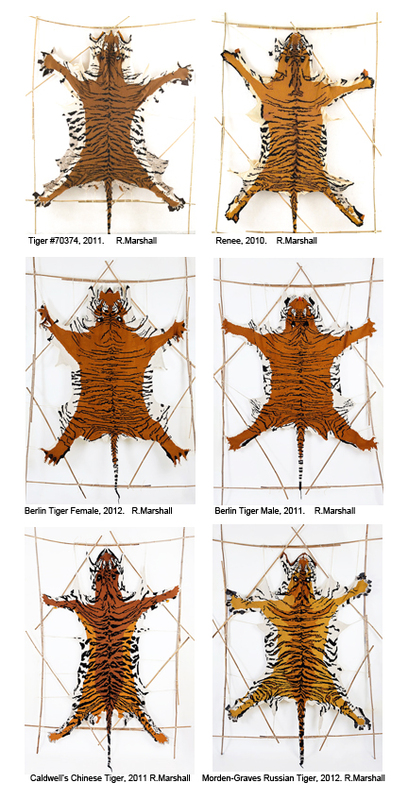 The Tiger Pelt Project reproduces and interprets full-size tiger pelts as knitted textiles. She has even recently published a book on her work. Available from Amazon. "After long days working at the Bronx Zoo, Marshall would return home at night and knit as a hobby. Her overweight, opinionated pet tabby cat named Rocky, was a faithful companion during knitting time. Inspired by the beauty of the intricate natural design of Rocky's markings, Marshall decided to try to knit a replication of his pelt. After exhaustively photographing, sketching and measuring her reluctant cat, his furry coat was translated into a knit pattern. Incorporating 2D and 3D traditional knitting techniques, Marshall was able to interpret the coat of "Rocky" into the first of her now signature pelt textiles". 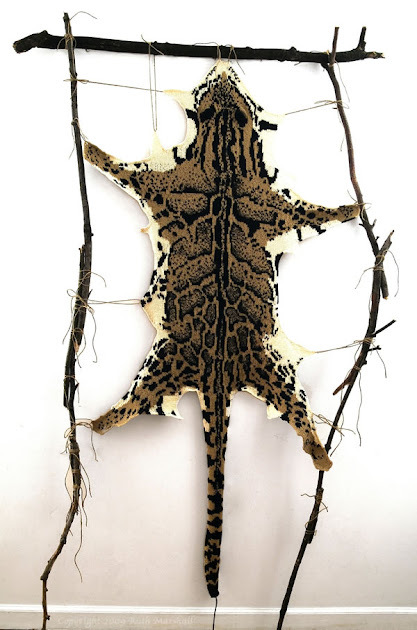 Elaine Bradford is another who specializes is crochet taxidermy. However, her work is a little more out there colour wise and she works with imaginary animals too. I particularly like the pushmipullyou (tragus januali) from Dr Doolittle. 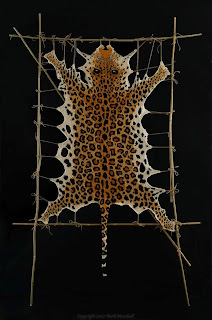 Donya Coward works in textiles producing fabric covered taxidermy. She specializes in dogs particularly. I love how this Jack Russell terrier is covered in sequins and doilies. Finally a crocheted animal head from Magda Van der Vloed, a South African artist made using wire and recycled plastic bags. Looks like old fashioned granny squares. Now I'm off to the op shop with my son who wants some stuffed toys to make some animal head trophies for his boy cave.